This is my pick of the festival. I just loved it. I was a bit concerned going in as, as I have mentioned previously, I am not good with scary films. I have never seen most of the classics that people talk about, including The Blair Witch Project. So, when I read the blurb in the festival program about Troll Hunter before watching it and it mentioned both The Blair Witch Project and Cloverfield I wondered if I was going to be able to take it. Perhaps it is not so scary for most people – I was scared – especially in the cave scene. What it does have is humour – and humour which is really played down. The concept is that there has been some unusual bear activity in some of the forest areas of Norway, and so a group of film students decide to go out and investigate. They come across an odd man dressed in Indiana Jones style garb and decide to follow him, despite his strong discouragement. However, when they gain footage of a troll in the forest, they are able to get him to admit to a huge government cover-up. Norway has trolls and their populations are controlled, both in numbers and where they live. He agrees to let them document his work as he is unhappy with his work conditions (love it) and so the chase for trolls begins. 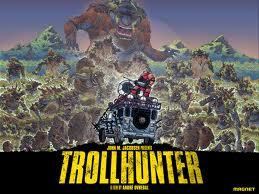 I think one of the things I loved in this film was the excellent use of CGI trolls. Often in monster films, it is not seeing the whole monster that makes it all the more scary, but in this case, I really liked seeing the variety of trolls that ‘exist’. I highly recommend this – funny, a little scary, and just good fun.